She’s about a foot tall, she sleeps a lot and we’ve named her Frida, after Frida K(o)ahlo. It’s incredibly distracting having what is essentially a teddy bear sitting in the gum tree outside the window. I keep having to go outside simply to stare up at her. She is mostly still, but on occasion she’ll scratch or reach up for a leaf to chew. Sometimes she’ll shift herself up the tree a little further to avoid direct sunlight or reach better leaves and probably to relieve a numb bum. We’re staying in my cousin Margi’s farmhouse near Lismore in northern New South Wales, where, like everywhere else in the country, koala numbers are declining. The slow-moving creatures are threatened by habitat removal, cars, dogs and now by climate change. The situation is so bad that in a report released at the Copenhagen summit, some experts predicted the animals will be extinct within 30 years. Koalas (Phascolarctos cinereus – ‘ash-coloured bear with a pouch’) are found nowhere but Australia and despite appearances are not bears but marsupials, most closely related to the wombat. Looking at Frida, it’s easy to imagine that the Australian government has invented this iconic animal as a marketing ploy, strategically placing cuddly toys high up in the eucalyptus branches around the country. The versions on sale in tourist gift shops certainly look the same, and are about as active. However, for the purposes of this article, we’ll go along with the deception and accept that it’s a real animal – fossil evidence shows koalas to have been in the country for at least 20 million years. During this period, the furry creatures have evolved a highly specialised, finely tuned digestive system that enables them to survive on a diet that consists entirely of toxic eucalypt leaves with very low nutritional value. Koalas have a specially adapted stomach and liver, and a 2-metre-long caecum (a kind of appendix) to cope with their specialised diet. 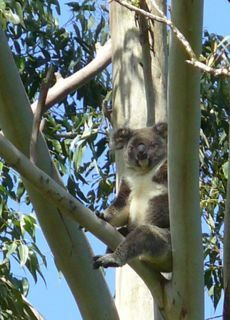 This bizarre evolutionary direction – early koalas were less fussy and enjoyed a range of rainforest flora – is often talked up by scientists as a wonderful example of niche exploitation. But it is making the fluffy climbers more stupid, as a consequence. Whereas their ancestors’ brains once filled their cranial cavities, researchers exploring the fluffy depths of modern koalas found the brain’s two cerebral hemispheres to be like “a pair of shrivelled walnut halves on top of the brain stem, in contact neither with each other nor the bones of the skull. It is the only animal on Earth with such a strangely reduced brain”. Brains do require a lot of protein and energy to function, and eucalypt leaves do not an intellectual make. Still, just how much brain power does a sleeping, eating teddy bear need? Would it really matter if we lost such a stupid animal? The problem is that we humans are stressing out the koalas – and koalas have not evolved a way of dealing with stress. They have had few predators during the past few million years: they may have been preyed on by thylacines (a stripy marsupial dog that went near-extinct a couple of thousand years ago with the arrival of the dingo); wedge-tail eagles and powerful owls hunt koala joeys, as do pythons. But there isn’t evidence to suggest that the aboriginal people ever hunted them – in fact, Steve set out to find out how tasty koalas are, following an autopsy of one, and declares that they are nasty to eat, “stringy, rangy. You’d have to be pretty desperate,” he concludes. European arrival led to large swathes of their trees being felled for the timber industry and for agricultural clearance, forcing them into ever smaller areas. Then there was the fur industry, which exterminated millions of the fellas and wiped them out completely in South Australia. Cars run over thousands every year – they cross the roads slowly – and feral and domestic dogs attack them. Those that don’t die from their injuries suffer a delayed stress response that commonly manifests itself as an outbreak of chlamydia or retrovirus, both of which can be carried asymptomatically in a healthy animal. Chlamydia causes ‘dirty tail’ (incontinence), conjunctivitis and often leads to infertility and blindness. Retrovirus causes cancers and an Aids-like immunodeficiency (which is similar to a leukaemia that effects gibbons). Both are killing koalas in large and annually increasing numbers. And these stress-induced sicknesses are much more prevalent in areas where their habitat and its important eucalypt trees have been encroached on by humans, either by development or for agriculture, or made inhospitable by climate change. Koalas are disappearing from the high ridges in NSW because years of sustained droughts have caused the eucalyptus trees there to become even less nutritious – they kick in a water-conserving metabolic mechanism that leads to far greater concentration of toxins and tannins in their leaves and reduced production of young juicy leaf. And global warming is also killing the koalas. They have not evolved a method of cooling themselves like other marsupials, and so they overheat and die or seek ground cover, which makes them more vulnerable to dog attacks. The increase in bush fires is also taking its toll – around 70% of koalas in a forest will die in a fire. There have been reintroduction efforts, in South Australia, Victoria and even WA, but these have all been bred from just three individuals introduced to Kangaroo Island, and so do not have the healthy genetic variety of wild types. Looking out at Frida as she sits with her bottom snugly held at a fork in the branches, it’s hard not to break into a smile and incredibly sad to realise that such a viewing is becoming ever rarer. Koalas sit up like little people, they are almost the only animal other than primates to have fingerprints (which are almost indistinguishable from human prints), they have opposable digits (actually two fused opposable ‘thumbs’) and they’re very cute. 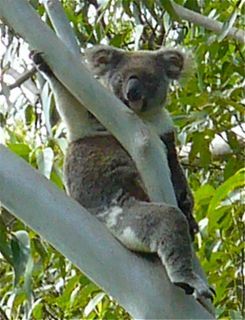 Humans can live in harmony with koalas by being more thoughtful: keeping dogs restrained in rural areas; planting their favourite dinner; driving with especial caution between 10 pm and 11pm (when they are most active) and dawn; and approaching development sensitively with their needs in mind. And, tackling climate change. Everyone needs a teddy bear. *Regular readers may have noticed a bit of a gap between postings on the site – sorry for the long silence. We’ve been doing a bit of sorting out, recovering and housekeeping of all the stuff we’ve been putting off while travelling through Africa. Such as taking our nasty bilharzia medication (perhaps diving Lake Malawi wasn’t such a great idea), fixing our broken equipment and replacing lost and damaged items. Part of this meant bidding a sad goodbye to my lovely little linux EEE PC that travelled with me for the past 15 months – it died on me and can’t be resuscitated, according to computer shop experts. But, I’ve replaced it with something that will let us edit footage and images (hooray). So, instead of the one-take-wonders that you’ve had to endure, we’re going to try to learn how to make more interesting little videos. We have so much footage from the past section of the journey that we will be uploading in the next week or so, including gorillas, koalas, gelada baboons, chimps and more. So check back. And, we’re also planning the next stage of the journey, which will take us from Patagonia to Mexico. Please send any suggestions of interesting projects, people or places I should visit, particularly for the first section: Argentina and Chile. Oh really – we’ll have to play with the sound levels. Thanks.